I’ve finally gotten around to posting photos of the reflective mudflaps, plus a couple of mudflaps actually in use. 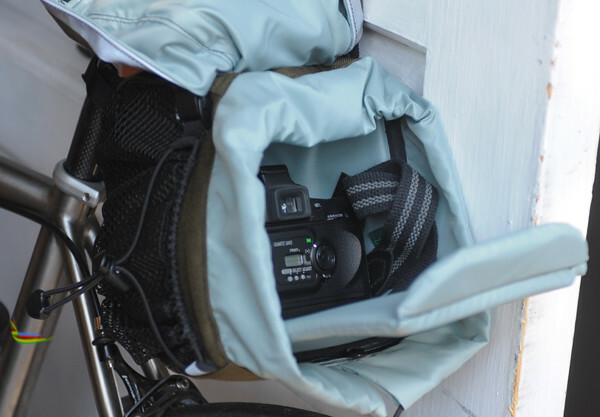 There’s also a new padded camera insert available for the small saddlebag. It’s available on the Small Saddlebag page, as well as under “Now In Stock”. 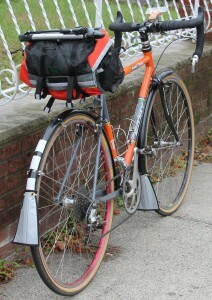 For more details and photos of it in use, check out this recent post on Lovely Bicycle! I’ve been wanting to do some of the rides in the DC area where my parents live for some time, and haven’t ever gotten around to it. So when my schedule conspired against me when it came to the New England 600k’s, I went looking farther afield. The ROMA 1000k looked perfect, plus it would have the added bonus of being late enough in the year to not be swelteringly hot. 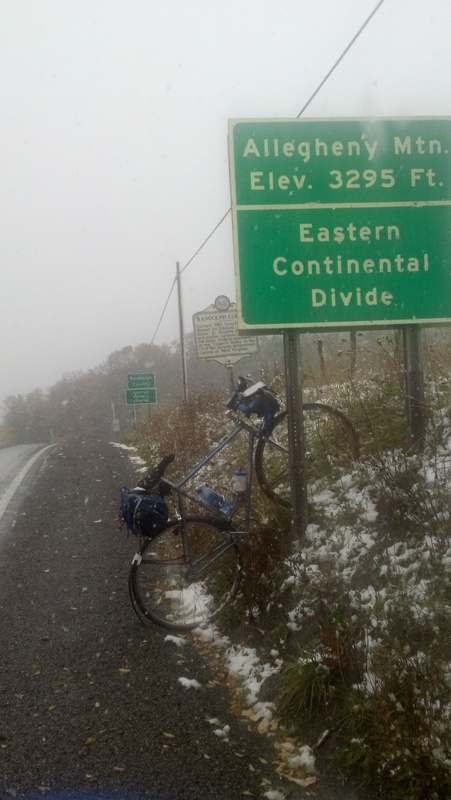 When I wrote to Matt Settle of Randonneurs of the Mid-Atlantic asking if there was still room in the ride, he replied that yes, there was room, but that it tended to be “sparsely attended”. It turned out that I was the only participant, but that Matt has run it for only one or two riders plenty of times before and doesn’t mind, so as long as he doesn’t mind, I’m happy enough to ride by myself. The route starts in Gainesville, VA and heads more or less due west through West Virginia to Parkersburg on the Ohio river and then back. It’s pretty much mountains straight across – they don’t call West Virginia the Mountain State for nothin’. When I got home, I entered the route into GPSies, which calculates it at 57,362 ft of climbing. Maybe I should be glad I didn’t know that before I started! So my Dad dropped me off at IHOP in the wee hours of the morning. Matt shook his head and muttered when he saw my bike, which is my trusty and beloved 1974 Raleigh Professional named Archie, and which is a fixed gear. It was a little odd to have the pre-ride spiel about various route related details sitting across a plate of eggs from the organizer rather than standing around in a parking lot in a group. We’d had a bit of a hard time finding the IHOP in all the shopping centers, so we got there with only a few minutes to spare, but I took a few extra minutes to have breakfast before starting the ride anyway. It’s not like the rest of the group was going to leave without me, after all! The beginning of the ride was quiet and pleasant. It’s a bunch of crappy suburbia to get out of town, but at 4AM there’s no one around and it’s peaceful and nice. The route for the whole ride is pretty straightforward. The whole cuesheet fits onto three pages with room to spare, and each leg fits onto no more than a quarter page so that it fits neatly into a cuesheet holder with no page turns. On the other hand though, there were a couple of spots where I managed to get thrown off and it didn’t take me long to find the first one. Even looking at the map after the fact, I’m not totally sure how it is that I got off course given a really quite simple cue, checked the map on my GPS and found what I actually thought was the right road, even though it was fairly rustic dirt and turned out to be quite a steep climb. Hmm, maybe all the New England dirt road rides I’ve done this year have messed with my instincts, if it seemed reasonable to me that a steep and gnarly dirt road might actually pop up in a 1000k with a 3-pg cuesheet. But with a couple more GPS-checking stops, I found my way back onto the actual route without having gained more than a couple of miles. Actually, I didn’t even figure out what went wrong until going back through on the return, and even then, I am not sure how or why because it really wasn’t that complicated. The next detour came just a bit before the first control in Front Royal, where a typo in the cuesheet sent me to the right where it should have been a left. But when the next turn didn’t show up, I figured it out and no great harm was done. I was a bit concerned when I got to the first control one minute before its closing time. But I’d started a few minutes late and made one wrong turn (actually two, but I hadn’t figured that out yet), so that was that. I made it a short control stop, but ended up wasting yet more time in Front Royal trying to figure out what was wrong with the first couple of cues. At that point, I made it a policy for the rest of the ride of setting the GPS to automatically route to the next control and using it to verify that I was going in the right direction, verify each turn, and just letting it re-calculate whenever the cuesheet differed from the GPS route. Front Royal is in a gorgeous, scenic area of Virginia that I’d been back and forth through a lot recently for various family functions, each time thinking how nice it would be to have my bike with me. The last time I was down there, my uncle and I had some time to kill before he dropped me off at Dulles Airport and we drove down Fort Valley Rd and went walking around on some of the trails for a bit. So I very much enjoyed riding down the same road. 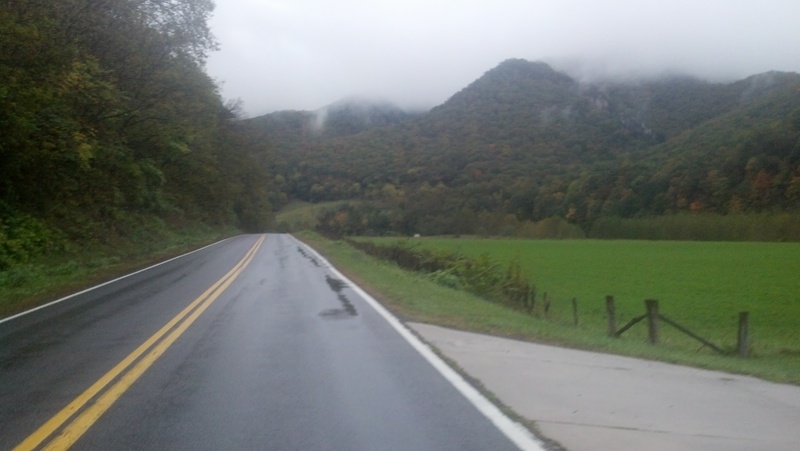 After Fort Valley Rd is when the first section of real climbing started, including Edinburg Gap, Wolf Gap, and Mill Gap. The weather was nice, cool but sunny, the perfect riding temperature and with clear visibility for the spectactular views. It was somewhere along there that I realized that I’d brought my camera, but had left the battery in the charger, which is really unfortunate because I had lots of cause to wish for it over the course of the ride. I took a few with my cell phone, but it didn’t have much battery life out in the sticks, so I don’t have very many. Edinburg and Mill were good climbs, but not terribly out of the ordinary. 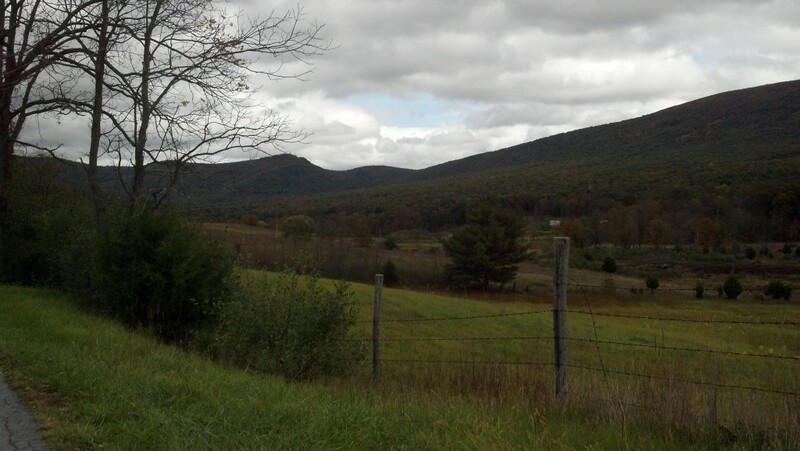 Wolf Gap could be aptly described with the same terminology as the female of its namesake. Most of it wasn’t too steep; actually, an impressive percentage of the climbs on this whole ride were neatly graded to around 7-8%. Wolf Gap was probably mostly around there, although with some steeper parts as well. But it went on and on…. and on…….. and on. 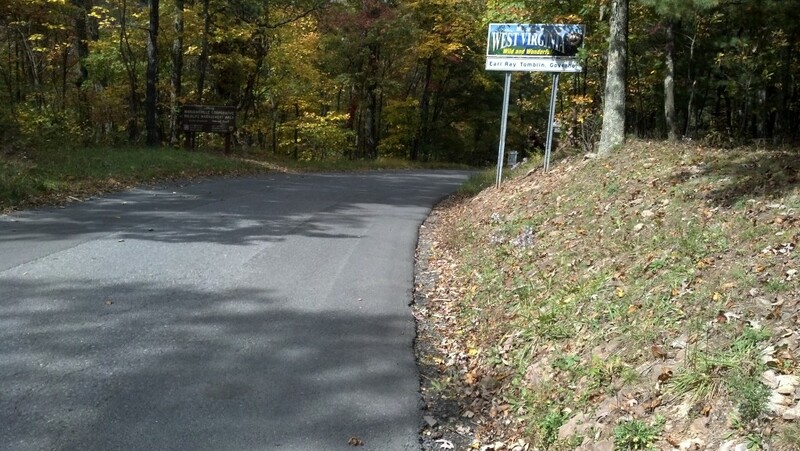 Finally the West Virginia state line appeared, and the road started going down. At the bottom of the hill, I arrived at the control in Lost River, WV with 15 minutes to spare, feeling reasonably pleased about that since I’d lost so much time leaving Front Royal and then climbed three gaps in a row. I was hungry though, so I stayed at the Lost River Grill for a real meal before heading back out. It was somewhere in there that I began to discover what my Super Power is: I apparently have the ability to make every dog in West Virginia go berserk. I got chased by the first one while climbing a moderate grade. There was no way I could outrun him uphill. The owner was there across the yard and found the whole thing fairly amusing, while assuring me that the dog was friendly. Meanwhile, the dog was coming at me with bared teeth and I started yelling at the owner to call the dog back. The dog ignored the half-hearted calls. I came to a stop and stared the dog down as he stood there growling at me. I didn’t really want to squirt my bottle in his face because I figured I’d want to drink the contents of said bottle at some point. I finally just started yelling “NO! Bad Dog!” and pointing in my best mean and authoritative voice, and the dog backed down and I kept riding. I got chased in earnest at least five or six other times, but for all of those I was either going fast enough to outrun them, or they responded or at least hesitated when I yelled “NO! Bad Dog! NO!” and I didn’t encounter any more dog owners. I did get barked at by every single dog outside a house or chained to a tree, though. Guess they don’t see a lot of cyclists. I didn’t see any others for the whole ride, except a handful going the other direction on Wolf Gap. Actually, I felt bad for a lot of the dogs I saw; they were chained to trees outside of houses, sometimes five or six of them chained to five or six different trees, apparently there most of the day and most of the night. I guess barking at the cyclist is the most excitement they’re going to get all month. After the descent, the road wound around through the setting sun between the ridges for awhile until arriving in Seneca Rocks. The night was young, but I’d already started getting sort of sleepy. True to form for the ride so far, I made it in one minute after the control’s closing time. It was getting chilly, too. So I had some Ramen noodles to warm up, as well as one of those disgustingly sweet Starbucks coffee things, and put my head down on the table for a few minutes until the owners were ready to close up for the night. The guy there asked where I was headed and I told him; the response was, “But there’s like, a big mountain in between! Actually, there’s a couple of ‘em! I used to ride bike, but I wouldn’t ride that way.” He did go on to say that he used to go on 20-30 mi rides on the C&O Canal towpath. He also said he’d heard something about snow in Elkins, but so far I’d managed to dodge any rain and was keeping my fingers crossed. Having been thus fairly warned of the mountains, I started on my way. Yes, it was getting chilly. Some stupid weight weenie voice in my head back home had told me that I didn’t need to pack tights. Well, with no one else to talk to, I gave that little voice a stern talking-to. The temperature was in the low-to-mid 30′s, and there were indeed mountains. Six or seven of them, including the Eastern Continental Divide. They were all long, steady grades mostly at 7% or so. Actually, I was generally impressed with the road quality over most of this route. The roads were evenly graded with good pavement and nicely banked switchbacks. If you like switchbacks, you’ll love this ride. Nice switchbacks make me absurdly happy, generally. But in this section, the descents were COLD. At one point I squeezed my water bottle to drink, and I heard a loud snap. It turned out my water bottle had cracked like a plastic cup, but I didn’t even realize it until I noticed how it kept dribbling all over the place when I tried to drink from it. It was impossible to dress appropriately without stopping at the top and bottom of every hill to change clothes, which I don’t like doing. So I blinked sweat out of my eyes all the way up each one, and then froze all the way down. For some reason, being cold makes me get sleepier, and I had to work hard to keep alert. Incidentally, you might think that descending switchbacks on a fixed gear ought to keep you awake pretty effectively, but it doesn’t. The overnight control wasn’t until Buckhannon, still 30 mi away, but I was getting very drowsy. So I stopped in Elkins quickly for some more iced tea for my water bottles (I still hadn’t figured out yet that one of them was cracked… guess I wasn’t at my sharpest!) and another one of those disgusting (but caffeinated and caloric) Starbucks things. I stayed much more alert on the road to Buckhannon, which was for the most part just hilly enough to keep me a bit warmer but without the frigid descents. I got into Buckhannon a little behind closing time for the control, and then rode around in circles for awhile looking for the motel because the cuesheet listed street names and the signs had only route numbers, and my GPS apparently had out of date street names. But I found it eventually, now 45 minutes behind schedule. But the good news about 1000k’s is that after the first 400k, the required pace slows down a bit so you have a bit more time. So I took a couple of hours and got some sleep before heading out again. Day two was an out-and-back to Parkersburg, WV. It’s the so-called “flat part” of the route… but that’s all relative. It’s still constantly relentlessly up and down, except that none of the climbs are all that long. They’re still long enough that you can’t make it very far up on the momentum from the previous one though, and they still have nice switchbacks. 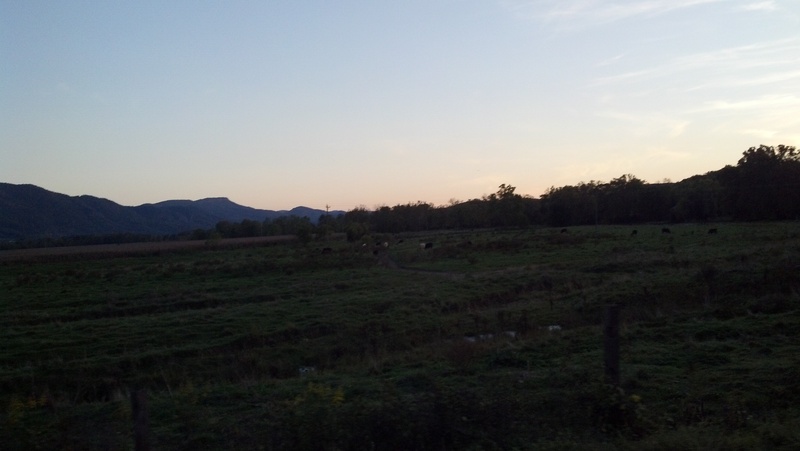 The first part of the day was more like what one thinks of as stereotypical Appalachia. Most of the stereotypes about redneck houses (falling down roofs covered by tarps, hay sheds leaning at 45° angles, etc), yards (littered with rusty junk and partially-disassembled machinery), vehicles (aging pickups), and clothing (woodland camo) apply. The people also have very distinctive mannerisms and regional accent. I don’t think I’ve ever been anywhere where I felt like such an alien walking into convenience stores in a bike helmet and brightly colored non-camo spandex, or even just by opening my mouth and speaking. Definitely a cultural experience. I stopped a short ways into the first leg of the day at a breakfast buffet place, which was great because the buffet meant I could try a little of everything and then get more of whatever went down easily. Ham, home fries, and fruit salad got enough calories into me to keep me going for a good while. The route from Buckhannon to Glenville was mostly on US 33, which is a large divided highway for some of the time. But yet it is also a marked and designated bike route with regular signage instructing bicycles to use the shoulder (which was wide and smooth and not too terribly full of debris). It felt really strange and somehow illicit to be riding along on a divided highway like that, but otherwise it was actually pretty nice and there wasn’t much traffic. I might not have liked it so much if it had been hot and sunny (not much shade), but since it was cool and overcast, it was nice. I rode through lots of little unincorporated hamlets with odd names. My favorite, for obvious reasons, was Pickle Street. The road was called Pickle Street at that point, too. I didn’t want to stop and power on my cell phone for a photo, which is too bad. The fall foliage was out in full force, as far along even as that we saw the previous weekend in northern Vermont. There was mist rising from the mountains like steam; my Grandma used to say that was the foxes cooking their oatmeal. It was noon by the time I got into Glenville, technically three hours after control closing time, but Matt didn’t seem to concerned about intermediate control times as long as I made it to the end on time, and I had gained some time since leaving the motel room in Buckhannon. I had some lunch at the Go Mart and continued on toward Parkersburg and the turnaround point. As I approached Parkersburg, the landscape changed. I swear that as I entered Wood County, I went straight from Appalachia to the Midwest in less than half a mile. All of a sudden, the lawns were neat, the houses were in good repair, and the cars were sedans and SUV’s instead of pickups. And even the terrain was a little different, in that it was composed of more single distinct hills than long, wrinkled ridges as before. Actually, it reminded me quite a bit of the Black Forest, so much so that a couple of times I could think of specific locations it almost could have been, had there been a little less vinyl siding and a little more Fachwerk. The hills were more like large rollers, with open views and well-kept pastures. Just before Parkersburg, I had another minor navigational glitch because the cuesheet said L on Rt. 50, which was another major divided highway. But the cuesheet didn’t say whether that was 50 West or East, and I wasn’t sure where the junction was in relation to the town. So when I saw a sign saying go left for 50 East and straight for 50 West, I turned left. A couple of miles later I hadn’t found the exit, so I stopped and messed around with the GPS until I figured it out. When I finally got into Tim Horton’s, I’d only gained 30 minutes on the time limit instead of the hour I’d been hoping for. But, I figured, at least I hadn’t lost time and at least I’d be unlikely to have any navigational difficulties on the way back since it would all be familiar territory. A hot meal and a quadruple latte hit the spot, and I ordered another five shots of espresso as well, which I dumped into the remainder of a bottle of chocolate milk I still had with me. Thus fed and caffeinated, I piled on all my various layers on my top half, still with only shorts and leg warmers on the bottom, and headed back out. The ride back to Glenville and then Buckhannon was dark, cold, and uneventful, but pleasant. I talked to myself, recited limericks, sang songs. I made it into the motel at 5:45 AM, “only” an hour and 15 minutes after closing. The heat was on full blast, which was a welcome contrast from the cold outside – I’d just passed a bank whose sign said it was 34°. 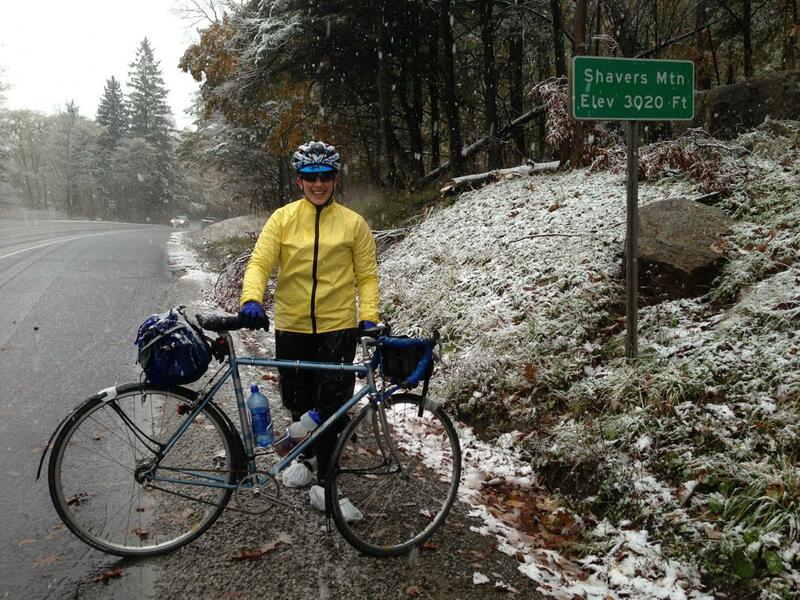 Not that we don’t ride in plenty of colder weather in Boston in the winter, but we usually wear tights. I was still running late, but Matt assured me that I had time to sleep a bit, so I got a couple hours’ sleep and left a bit after 8AM. By the Go Mart control in Elkins, I’d brought my deficit down to two and a half hours or so. It was clear that it wasn’t warming up much though, and it had started to rain a little. So I took some inspiration from the local aesthetic (by which I mean tarps on roofs) and taped some plastic bags over my feet. Then I cut a trash bag in half and made makeshift “rainlegs” out of it, taping one half to each leg at the knee, thigh, and hip, and tucking the rest up under my jersey. This solution actually worked surprisingly well, believe it or not; it kept my legs much warmer and drier, and was more functional than any actual rain pants I’ve ever owned (not that that’s an exceptionally high bar to clear). If you’re ever stuck, it’s a great trick, even if it looks goofy as you please. After Elkins was the series of six or seven climbs. I think the climbs are easier in the east-bound direction, but that might also just be because it was daylight and I was feeling a little more alert. But it was also raining steadily. As I ascended the first climb, I noticed the rain drops were getting chunkier… and then realized that it was turning to snow. It was actually snowing. On the way down, it turned back into rain, but on the second climb it turned back into snow again and even started sticking a bit. At the sign at the top, I decided that this was worth turning the phone on for a photo. There was a car stopped there, with a couple who had gotten out to take photos as well, and they saved me the trouble (and battery power) by taking one with their phone and texting it to me. Or rather, they entered in my number and sent it the next time they had cell service. By that point the snow started to stick to the road a bit too, on top of wet fallen leaves, so I went down the descents quite a bit more gingerly than before. It was still freezing on the way down though, to the point where it got hard to grab the brake levers. Seneca Rocks wasn’t a control on the return trip, but I still had to stop and get some hot Ramen noodles to warm up before I kept going. I’m sure I missed lots of fabulous mountain views in all that fog, but fog is pretty too in its own way. The route was still rolling heavily, but slightly more down than up, and by Moorefield my deficit was down to two hours. I was still entertaining hopes of finishing with an hour or two to spare, but that was dependent upon not getting so sleepy on the bike, which I’d been having difficulty with the previous two nights. So I did my best to caffeinate myself again, and I got going. The return trip differed from the outbound route, skipping the Lost River climb and staying on Rt. 55 instead. But one road or another, there are a bunch of long ridges in between West Virginia and Regular Virginia, and you have to get over them somewhere or other. This section, I have to confess, is something of a blur. I climbed for what seemed like forever through the unchanging dark, trying to get glimpses of the mountain profiles against the overcast sky for clues about how much longer it was likely to go uphill. I descended, legs spinning like egg beaters but eyelids drooping nevertheless. I climbed again. I descended again. Finally, I got into the last control before the end in Middleton. I was tired and sleepy and my deficit was down to only an hour, which should give me time as long as I kept the pace going. The last leg is more down than up, which obviously helps keep the speed up, but also makes it easier to get drowsy. Caffeine, sugar, and all, I was getting drowsy and slowing down more and more. I started thinking that the patches of wet and dry pavement were in fact bumps or other features to be ridden over gingerly. At one point I even stopped by the side of the road and stood there with my head down over my handlebars. I’m not sure how long I stood there like that, except that at a certain point I woke up and realized that I really had to book it if I was going to make it in time, but also that booking it hard was probably the only thing that could keep me awake and alert, anyway. So I put my head down and pedaled for all I was worth. I spent the last hour and a half or so in a mad dash of a time trial, keeping the pace up as hard as I could go. That was kind of fun, actually; I guess that after three days of it, my legs were used to doing what they were told. I was excited to be almost done, and it was getting light out too. Between the light and the hard pace, I perked up considerably. The approach to Gainesville had a little more morning traffic on it, and the last couple of traffic lights were excruciatingly long. Then finally, true to form, I got to the right area but couldn’t find the IHOP. I’d had a voice in the back of my head at the start saying I should pay attention, since we’d had a sort of hard time finding it at the start too. It’s a bit off the road, and all those friggin’ shopping centers look the same. I was cutting it really close on the time and getting desperate. So finally I called my Dad, who was waiting for me there, to see if he could talk me in, as it were. But just then, I spotted it. I’d made it, and I was done, in 75 hours. This was a fun, scenic, and very enjoyable ride. That said, it’s not for the faint of heart. It’s relentlessly hilly, and I think I might have had a very hard time had it been really hot. There are some long-ish sections without much in the way of services, and there are lots of dogs. But the scenery is gorgeous and the pavement is good. Even though a lot of it is on major numbered roads, the traffic is generally light. 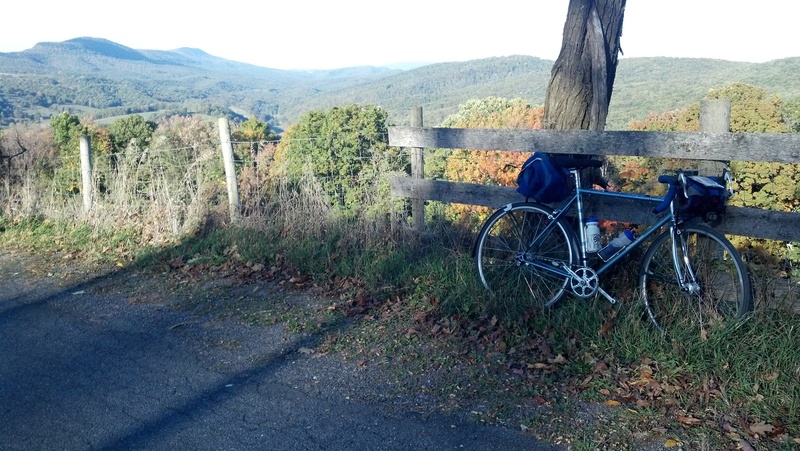 And it’s nice to have a ride that’s in the fall, since so much of the brevet calendar is long over by now. Plus, the fall foliage really is pretty. In a way, I think it’s actually a good route to do alone, because so much of it is long climbs that you just have to settle into your own rhythm on. I realized at the end of the ride that I’ve never had so little in the way of chafing or saddle pressure by the end of a ride this long before (not that I usually have much, but after three days and nights on the bike I expect a little), and I can only attribute that to the high percentage of the ride that I spent out of the saddle. My arms and shoulders are feeling it more than usual though, even for a hilly ride, since climbing on a fixed gear involves so much hauling up on the bars. This isn’t a beginner’s ride by any stretch, but if you’re looking for a scenic and challenging ride that may or may not have any other participants, it’s a great choice.